Among Roman Catholics in Italy, he is said to be second in popularity only to Pope John Paul II. For years, he has been regarded as "the people's saint" and the monastery where he prayed is a place of pilgrimage. Yet the object of this devotion is a humble monk, who for much of his life was regarded with deep suspicion by the Vatican. His name is Padre Pio, and on Sunday he officially joined the ranks of the saints. The Pope, a long-time admirer, conducted the ceremony in St Peter's Square in front of hundreds of thousands of people. The canonisation should finally settle decades of arguments about the mystic monk. His real name was Francesco Forgione, and he was born in a small town near Naples in 1887. As a teenager he had a vision, and joined the Capuchin order. He took the name Pio, which means "pious" in Italian. He might have spent the rest of his days there in obscurity, living the simple life of a monk. But then he began to display the signs of the stigmata - the wounds inflicted on the hands, feet and side of Christ when he was nailed to the cross. 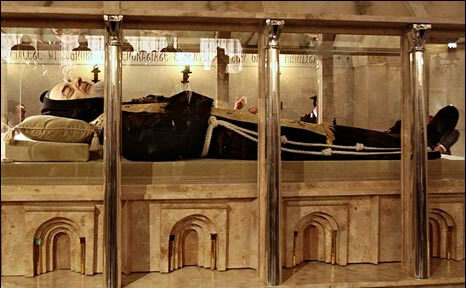 For the next 50 years, blood continued to seep from Padre Pio's palms. He was the first priest in centuries to bear the marks of the crucifixion, and it turned him into a living legend. The Vatican was not convinced, however, and for 10 years ordered the monk not to celebrate mass in public. 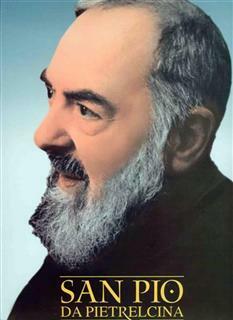 Throughout his life, Padre Pio had to face accusations of being a fraud. Some church leaders wondered if he used acid to make his hands and feet bleed. Because of his popularity, he became the victim of a dirty tricks campaign. Rumours were circulated about alleged relationships with women. Astonishingly, confessional boxes were bugged with hidden microphones in an attempt to gather evidence against him. But his enemies could not discredit him, and stories about his miraculous healing powers spread his fame far beyond Italy. By the time of his death in 1968, he had millions of followers, not just in Italy but around the world. His funeral was attended by 100,000 mourners, and his monastery in San Giovanni Rotondo has become a place of pilgrimage that rivals Lourdes and Assisi. The Pope has created many saints, but few have been canonised so quickly. As a young man, the Pope travelled to Italy to make his confession to Padre Pio. Forio Tessari, a Capuchin priest who argued Padre Pio's cause at the Vatican, believes the Pope was impressed by the way the monk endured a life of pain without complaint. "The Pope was struck above all by the spiritual figure of a man who had a strong experience of God, who prayed, suffered in silence, and obeyed his superiors with faith," he says. Today, millions of Catholics around the world invoke the name of Padre Pio in their prayers, and stories about his healing powers continue. It is a remarkable transformation for a man frowned on by previous popes. To endure decades of speculation and rumours, and retain his faith, Padre Pio must truly have had the patience of a saint. Now, in front of thousands of people, the Pope has made that designation official. Known as: "The living crucifix"